QfAnne: What were you thoughts on the Blizzard Watch D&D session? It was fun! I was slightly concerned about whether or not I’d remember what to roll for what, but after we got into the swing of things it was easy enough to keep track of. We never really solved the mystery of how we ended up where we were, but I think it ended on a pretty satisfactory note, and left us room to continue if we ever feel like doing that again. As a side note, for those that missed the D&D session (it was on a Saturday after all), it will be released to our podcast feeds later today. Fair warning though, it clocks in at about three and a half hours in length! Q4tQ: Should we be getting a new Overwatch short soon? Technically they don’t really have a “set” release schedule for their animated shorts — however, the last one we saw was back at BlizzCon, so they’re kind of due for another one, aren’t they? But even if we don’t see another animated short anytime soon, it looks like the Overwatch team is up to something, as some interesting news articles popped up on the website over the weekend. We just got a new hero not too long ago, so I’m wondering if this means a new map is on the horizon — or just some more story progression? Either one would be cool, but as a fan of lore I’m leaning heavily in favor of the latter. Q4TQ: if you were forced to play a single character for the rest of your WoW life, what race/gender/class combo would you pick? My Blood Elf Rogue. I mean…she’s been my main pretty much since Burning Crusade came out. Sure, I’ve had plenty of alts in the meantime, but I always go back to her. The Rogue class has always been a favorite of mine, and the story behind the Blood Elves was always appealing — even more so now that the Sunwell has been reignited. I mean, the race has started to physically change as a result of what happened at the end of the Sunwell raid. It’s an interesting side effect that as yet hasn’t really gotten a lot of story…but maybe it should at some point. Q4tQ: Just how old is the average Tortollan? When a Tortollan goes on about not wanting an artifact unless it is at least two centuries old, or about having great-grandchildren that are older than you are, does a 10,000+ year-old Night Elf or a 25,000+ year-old Draenei quietly roll their eyes? Tortollans live for at least seven hundred years, if not more — and they tend to stay out of the affairs of land dwellers, so it’s not like they’re in constant danger of extinction or anything. I don’t think any of them are quite as long-lived as the Draenei or even the Night Elves, however. They’re definitely not immortal, they just live for a ridiculously long time, much like their real-world turtle and tortoise counterparts. That said, it’s doubtful a Tortollan really comprehends what a Draenei actually is, or knows anything of their history. Alien race and all, you know? They may just assume the Draenei are like everyone else that wanders through — a landwalker with a short life span. 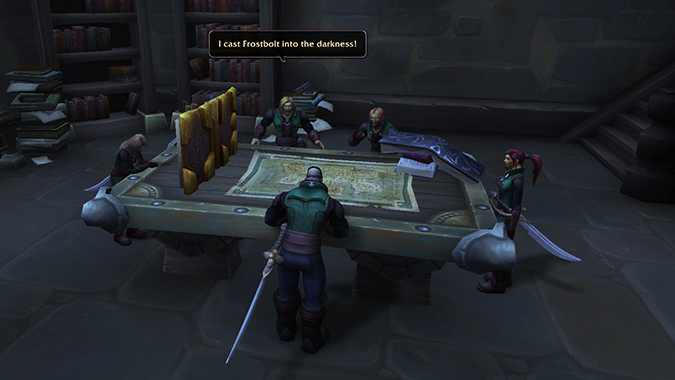 Why have we STILL not seen the Taunka take part in Horde affairs? They pledged the blood oath and are as much a part of the Horde as any other race. I’m not saying they need to be playable, just that they should be DOING something. Putting lore to the side for a moment, I’m going to say the most likely answer for this question is simply that they were a Northrend race that was never really intended for future play. While the male Taunka have a drastically different model than your run of the mill Tauren, the ladies are pretty much identical to every Tauren out there right now. So they feel like expansion filler that wasn’t really intended to apply to future expansions. However, if we want to look at it from a lore perspective…Northrend wasn’t really free and clear of all its troubles following the defeat of the Lich King. In the novel The Shattering, Saurfang even stays behind in Northrend as part of the skeleton crew up north taking care of issues. Given all the Taunka suffered during Wrath — keep in mind, they were in pretty dire straits when they joined up with the Horde — it stands to reason they’d also want to stay behind and rebuild. And with that in mind, I don’t think Garrosh would’ve really pressured them to travel south or suddenly take up residence in Orgrimmar. His idea of the Horde was all about strength, and at the time, the Taunka didn’t really have the numbers to provide any kind of substantial support. I imagine since then, they’ve mostly slipped under the radar — certainly Sylvanas hasn’t given them a first thought, much less a second. Lore question… What was the in universe year the dark portal was first opened? and what was the in universe year that Burning Crusade took place? The Warcraft timeline actually starts with year 0 — and that’s the year the Dark Portal opened. Warcraft: Orcs and Humans was the first game created, and the events in that game are basically considered the starting point for everything that comes after. Azeroth’s history didn’t really begin to get any kind of expansion until later on, at which point events in Azeroth’s past were simply given a negative number. So the War of the Ancients took place in roughly -10,000, or ten thousand years before the Dark Portal opened. Burning Crusade began in year 26, when we tromped through the Dark Portal and arrived on Outland. The Alliance we discover there have been there since around year 8, which is when the Sons of Lothar jumped through the Dark Portal to tackle Ner’zhul. They were stranded there when Ner’zhul basically blew up Draenor, and basically spent 18 years just trying to survive before we showed up and realized oh hey, these guys are still alive.